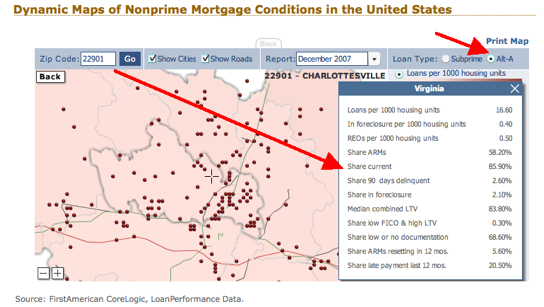 You are here: Home / sideblog / Want to know how many subprime and Alt-A mortgages there are in Charlottesville? Want to know how many subprime and Alt-A mortgages there are in Charlottesville? If I read the numbers right, 65% of the mortgages in the 22901 Zip Code (the major Charlottesville Zip) are ARMs. Is this opportunity getting ready to knock (for those real estate investors out there) or a major, major issue we need to get a handle on? Thanks to the Calculated Risk and the Federal Reserve. Interesting stats, Jim–which I just found by clicking on your sideblog. Do you have any update on this? Insight? Quite a thing to put off on the side! Looking forward to your 1Q info on Monday.